On October 10th, 1950, the FCC granted a construction permit to L. C. Harrison to build a new station to serve the Lawrence area. He had set up the Lawrence Broadcast Company to build and operate the station. Soon afterward, however, Mr. Harrison passed away. A consortium led by former WREN personality Arden Booth incorporated as Lawrence Broadcasters, Inc. to acquire the assets and complete the station. The FCC approved the transfer on December 14, 1950; construction of the station began on December 16th. By February 3rd, 1951, construction was considered complete and ready for the station to be licensed. At 7:15 in the morning of February 22, 1951, Arden Booth said to the city of Lawrence, "Good Morning. This is KLWN, Lawrence, Kansas" as the station signed on for the first time as a day time station on 1320 kHz. The location of the main studios and tower was described at that time as "1 mile south of 23rd Street on U. S. Highway 59 near Lawrence, Kansas." Although the station was substantially completed and was broadcasting by February of 1951, the transmitter was only partially completed - a note on the station's license application stated that the ground system could not be buried due to winter weather conditions. KLWN had two extensions of its programming day. A radio treaty with Mexico allowed KLWN to sign on at 6 AM, and run two hours past sunset (and 6 AM-Sunrise) at a reduced power. When Canada joined the treaty, KLWN received nighttime authorization at half its daytime power, effective June 1, 1980. On August 20, 1963, Commercial FM Radio came to Lawrence as KLWN-FM first signed on. The main reason that it came on was to get a full-time signal to broadcast sports and other information, including school closings. Because sunrise is at 7:45 AM during the winter, school closings could not be disseminated to the public in a timely fashion via the AM station. Hank Booth, Arden's son, had said (joked?) that the FM was originally run by a tape, and that no one listened until it was time for KU or Lawrence High Football. More information can be found at this page. An Ad from the December 18, 1964 Lawrence High Budget advertising KLWN-FM's coverage of LHS Basketball. KLWN has always been dedicated to cover local sports. KLWN carried Lawrence High School Football on a tape-delay basis at least until the KLWN-FM came to the air. KLWN-FM and KLZR carried LHS football from its inception until the conclusion of the 1994 football season. KLWN-FM also carried LHS and KU basketball games. In 2006, KLWN made all Lawrence High and Lawrence Free State football games available via live streaming and podcasting. The following season, KLWN carried all Lawrence High games while co-owned KMXN carried all Free State games. In the book Max and the Jayhawks Max Falkenstein talks a little about beginning his career as the "Voice of the Jayhawks," on WREN, in Lawrence at the time. Because KLWN was a day timer, they carried some football (separate from Max's network), but no basketball. When the FM was established, it joined the KU network. The current KU sports network dates back to about 1984. The Jayhawk Network brought in Bob Davis with the play by play, and Max stayed by doing the color. KLWN (by then a full timer) and KLZR became the flagships of the new network, and Bob Newton (then KLWN/KLZR's Station Manager) got "suckered" into the Producer/Engineer position. When Max retired from broadcasting in 2006, the color commentary duties were split between David Lawrence in football, and Chris Piper for Basketball. In 2012, Greg Gurley replaced Piper on basketball comentary. Lawrence, Piper, and Gurley were all former Kansas Players. In addition to local sports, KLWN covers area professional sports, with an affiliation with the Kansas City Royals. The Royals were hesitant about granting KLWN an Royals affiliation, as they apparently believed that Lawrence was served well by its Kansas City and Topeka affiliates. KLWN eventually joined the Royals network on April 20, 1998. In Late 1998, KLWN signed on with the One on One sports network, which KLWN aired during the evening. In July 2000, KLWN announced that they would switch to ESPN radio and air sports talk most of the day. Brock Bowling, who previously worked at KLWN as a intern, took the position of Sports Director on August 7. A week later, he began KLWN's first five-day locally-oriented sports talk program, "The Hawk's Nest." In 2002, the local afternoon sports talk show was re-dubbed "Rock Chalk Sports Talk," with Brian Hanni and Brett Ballard as the new hosts. The show was also expanded to two hours. Brock later accepted a play by play position with the University of California-Santa Barbara, with Brian Hanni taking over as Sports Director. In 2012, Hanni accepted the role of Play-by-play announcer for Basketball and Baseball at Texas Tech, turning over the hosting role of RCST to Sean Levine. His ultimate goal, however, was to become the next voice of the Jayhawks. After Bob Davis retired at the end of the 2015-16 school year, many Kansas fans also wanted to see Hanni succeed Davis. Kansas ultimately selected Hanni for the play-by-play role on June 21, 2016. David Lawrence and Greg Gurley continue on color. Currently, "RCST" is hosted by Nick Schwerdt and Derick Johnson, with David Lawrence also making regular appearances. Lawrence had also previously hosted a weekly local sports talk show on KLWN. Other sites were looked at, including the present-day KU west campus area. However, West Campus was eliminated because they believed the Campus buildings would block some of the ground wave signal. During the 50's and 60's, and into the early 70's(? ), Arden Booth did indeed have cows grazing the pasture around the studios and tower. Old program logs at that time at sign-off read: "Sign-off, lower the flag, burn the trash, and feed the cows,". An expansion to the studio building resulted in a new studio and interview room. The old studio was then used exclusively by the FM station. The original transmitter for KLWN(AM) from March 1997, just prior to its dismantling. As Lawrence Grew, the city limits creeped closer to the station's site. Eventually, what was considered to be "near Lawrence" became the intersection of 31st and Iowa in Lawrence. By the 1990's, commercial developments surrounded the station site and the value of the property was rising (as were the property taxes). The family knew this was happening, and prepared for the inevitable. The first thing to be taken care of was the tower. The 105.9 FM tower was already well off site, but the original AM tower was still in operation. By 1996, land was secured for a new tower and construction began. On March 25, 1997, the new stick was ready to begin testing. On April 3, 1997, the old tower was torn down. Much of the tower was cut up except for the aircraft warning beacon that stood on top, which the station retained for posterity. With the tower gone, the Booths looked for a new home for its studios. Aldi foods bought the entire property and prepared to create a new grocery store. Meanwhile, the station leased the property back from them until they could pack their bags. The quickly found the old Woodward property in northwest Lawrence at 3125 West 6th Street. It took several months to get the building remodeled for a radio station. Finally, at 1:05 on January 11, 1998, the stations cut the switch at 31st and Iowa and began operations on West 6th. The old studios would be leveled a week later. The new studios featured contemporary digital equipment, eliminating the old-style carts. With the addition of the digital equipment, KLWN decided to end the tradition of signing off at 11:00, and began to leave the station on full-time, with the computers running the station during the previously "dark" hours. The site of the former KLWN studios at 31st and Iowa is now a branch of People's Bank. The trend in radio has been toward corporate ownership of stations in several different markets. Knowing that the Booth family could not run the station forever, Hank decided it was time to sell the station. However, he wanted to make sure, first and foremost, that the stations would remain in Lawrence. He found a family, the Zimmer Radio Group out of Cape Gireadeau, MO, that would do its best to maintain such a commitment. The title was officially transferred to Zimmer on September 1, 1998. With the Zimmers in control, most of the changes at the station started out in the sales department. KLWN did, however, make some changes in programming as well, adding a morning news program and the sports talk, and switched the news feed. Hank Booth was retained as General Manager of the stations. In November 2002, he decided to make a career change. He became the executive director of Kansas Wildscape, while the Zimmers allowed him to continue his longstanding "According to the Record" program and to broadcast other special events, such as local election returns. Rumors persisted for several years that the Zimmers were looking at selling their properties, including the Lawrence stations, to a larger corporation. Although the Zimmers spun off their properties in Southeast Missouri and Illinois to a new group, it was to newly-formed local group. Furthermore, the brothers divided the remaining stations between them, with one brother taking full ownership of the stations in each market. The eldest of the Zimmer brothers, Jerry, took control of the Lawrence Stations. Jerry Zimmer initially adopted the name "Viking Communications" for the operations under his control and acquired KKYD, licensed to Osage City. The name of the parent company was eventually settled as "Great Plains Media." On the day after thanksgiving in 2004, KLWN started to play Christmas music instead of ESPN programming. Hank went on the air to announce that changes would come after the holidays. One of the early changes that happened was the fact that Hank returned full-time to the station, accepting the Station Manager position. After Christmas, the new format debuted with the syndicated sports talk replaced with a mix of local and syndicated talk programs. Hank would eventually leave the station again, this time to take a position with the Lawrence Chamber of Commerce. The management has stated that he will continue to be associated with KLWN "as long has he wants to." One of the programs that emerged out of KLWN was "The Voice of Merrill," hosted by Chris Merrill. Merrill's style of "talk radio unusual" proved to be successful enough that he was given an opportunity as substitute host at KMBZ, eventually being offered a slot in their lineup in 2011. A year later, KOGO in San Diego offered him an opportunity in the afternoon drive-time slot. In 2013, the Federal Communications Commission began the AM revitalization initiative, making it easier for AM stations to move an translator in order to use the translator to simulcast the programming of the AM station on the FM band. Great Plains Media took advantage of this, acquiring the construction permit for translator K247BN in Madison, Kansas and moving the assignment to Lawrence to rebroadcast KLWN. Initially, Great Plains Media applied to move the translator from 97.3 MHz to 95.3 MHz, broadcasting from the 105.9 auxiliary site. Soon thereafter, the University of Kansas agreed to allow the translator to broadcast from the KANU tower on KU's west campus. GPM subsequently superseded the 95.3 application with one for 101.7 MHz from the KANU tower. The change in frequency also meant a change in call sign. The translator received the call letters K269GP on October 27, 2016. K269GP began testing in January of 2017 with an official launch on January 31. The License to cover was approved on February 8, 2017. KLWN would probably be no different than any ordinary station - or perhaps never come to be - without the guidance of Arden Booth. Arden was born December 3, 1911 in rural Brown County. He attended Fairview High School and later graduated from Baker University in 1936. His first stint in radio was at as an announcer for WREN. When World War II came, Arden went out to keep the troops entertained, doing programs in Hawaii and with the USO tour. After his stint in the Military, he managed a station in Oroville, California [KDAN, now KEWE] before moving back to Lawrence. Many thought that starting a new radio station was an extreme gamble - in fact, some had said they would help him out if he were starting a buggy-whip factory, but not a radio station. Almost immediately after starting the station, the floods of 1951 gave the station a big boost. During the floods, Arden was behind the mic broadcasting emergency information for hours straight - and then came home to a flooded basement. Some people had joked to Arden "How did you start that flood?" Arden had a philosophy of service to the community, as well as enjoying himself while he was at it, with notable lines as "If it ain't fun, don't do it," and "We have no right to exist but to serve our community." 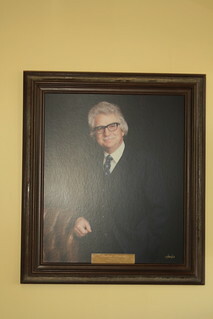 Arden's activities included participating in the Kiwanis club and serving as a state senator from 1971-1976, among others. One of the interesting things he did was when the Wakarusa Valley Watershed District wanted his help, to which he agreed - with the condition that they worked with the Clinton Lake project. Consequently, Clinton was the first Corps of Engineers reservoir built in cooperation with a watershed district. His service earned him many accolades, including the Kansas Association of Broadcasters distinguished service award, the Kiwanis Club Substantial Service award, the Lawrence Chamber of Commerce Citizen of the Years award, and a spot on the Kiwanis tablet of honor. Perhaps one of the most fitting tributes happened on March 25, 1997, when the east wing of the restored Union Pacific depot in Lawrence was named the "Arden Booth Free State Theater". Arden also was a man who placed integrity high on his list. There are stories that he would immediately throw records out the window if they contained songs that he thought were not proper - or, for that matter, were being used to promote products that had not bought advertising on his station. Arden Booth passed away Friday, March 10, 2000. His life was celebrated with a "final parade," complete with marching music piped in over his station, the following Wednesday, as well as a party - per AB's request. In 2012, the Zimmers and recently-hired General Manager Jay Wachs honored Arden by designating February 22nd (the anniversary of KLWN's first day on the air) as "Arden Booth Day" and placing his portrait in the front entryway to the building. KLWN: 500 W day, 250 W night, non-directional antenna full time. Transmitter located near 27th and Crossgate in Lawrence. K269GP: 170 W/172.3 m (565 feet) on the KANU tower on the University of Kansas Campus. Studios at 3125 West 6th Street in Lawrence. KLWN began with 500 watts daytime at 1320 KHz on February 22, 1951. Operated under emergency conditions during the Summer of 1951 due to the flood of '51. Eventually allowed to sign-on 6 AM-Sunrise and 2 hours past sunset. Full nighttime authorization at 250 watts granted July 1, 1980.